Cozy townhome at the heart of Glaciers' Reach, the Whistler Village premier location, steps away from ski lifts, bike and hike trails, restaurants, grocery stores, coffee shops and lakes. A perfect vacation home for families of up to 4 members, couples and individuals aiming to enjoy everything that this world-renowned destination has to offer. This unit is a new addition to the other two units we own in the same complex. Welcome to our cozy townhome at the Glaciers' Reach, the Whistler Village premier location, steps away from ski lifts, grocery stores, coffee shops and playground. This 3-level, 1 bedroom townhome has everything you need to make the best out of your Whistler vacation - whether you’re coming for a weekend getaway or a longer stay. 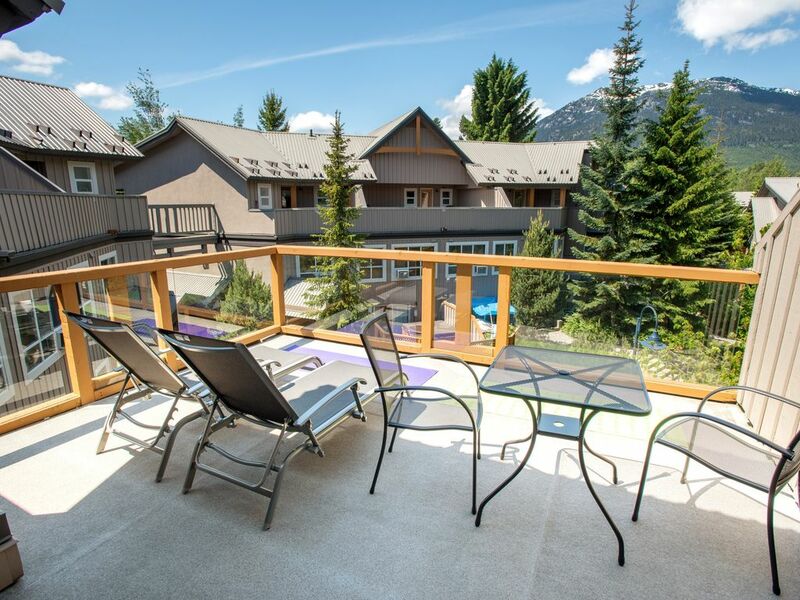 Enjoy stunning mountain views while relaxing on a huge South-facing deck (we even have a few yoga mats on hand). You won't need a car or hear any traffic if you stay at our townhome; even though it’s located in the Village, it’s nestled inside the complex and sheltered from the street noise. The entire suite has been remodeled and everything in it is brand new (including kitchen appliances and furniture). Free Wi-Fi, parking and bike locker are included. Our guests have access to the heated outdoor swimming pool and hot tub, located about 20 meters from the townhome entrance. Next to it you will find an indoor sauna, and a small gym, recently renovated. It is equipped with a commercial-grade treadmill and elliptical machine. The living-room features a brand new double size sofa bed, 42'' flat screen TV and dining set that comfortably seats 4 people. The kitchen is equipped with a full range of stainless steel appliances (range with oven, fridge / freezer, coffee maker, microwave, cooker, double toaster). The living room leads to a balcony where you can enjoy mountain views while drinking your morning coffee (see photos). The third floor features a bedroom with a queen size bed and 32'' HDTV, and a large bathroom with a tub. The bedroom is connected to a huge patio with two lounge chairs, and two chair and a table set. There’s enough room on the patio for session for two or a romantic dinner. The fully equipped kitchen features: Basic Food Staples, Coffee Maker, Cooking/Eating Utensils, Dishwasher, Fridge and Freezer, Garburator, Glassware, Kettle, Microwave, Napkins, Oven, Roasting Pans, Stove, Toaster. An outdoor enthusiast, a ski instructor and coach, fell in love with Whistler and decided to move there and enjoy the unique life it has to offer. A small gym, recently renovated - it is equipped with a commercial-grade treadmill and elliptical machine. Great stay and within walking distance to the village and lifts. The condo has everything one needs for a stay in Whistler. It’s close to all the festivities of the village, walkable to the lift, and quiet if an early night is needed. Tidy, close to village, as advertised. It was also very handy to the underground parking. We had a Thule on our suv and it fit in the underground no problem. Only downside was it was a bit of a squeeze getting through the front door and leaving your snow boots and gear in the foyer so as not to mess up the carpeting going up the stairs. We thoroughly enjoyed our stay. Great location in relation to the amenities of the village. The kitchen had all that we needed and the IGA is close by. Stayed here in October, left our car in underground parking and walked everywhere. I recommend this vacation rental. Great communication (timely and friendly) with the hosts. We had a special request that they kindly considered. Thank you. Ideal location for exploring the village. Simple, functional unit. Just what we were looking for. Great communication and easy to find. Very walkable to all the attractions in the village and a 15 min walk to the lifts. Clean. Gorgeous patios! Kitchen is well supplied. Would stay again!